In a Pickle, and Loving Every Minute! We’re in a pickle, and happy as heck about it! A few weeks back, we introduced our Ploughman’s Sandwich, a happy marriage of cheddar and chutney wedged between two chunks of ciabatta. It’s been such a bit hit, we’ve decided to send it out on the road! Now you can order a Ploughman’s Lunch cheese & chutney selection from saxelbycheese.com, and we’ll send lunch straight to your front door! The ploughman’s lunch is a revered repast in pubs and taverns all across England… We discovered it on a trip across the pond this summer and thought, why not bring this cheesy institution stateside? The traditional ploughman’s lunch features a couple of hearty chunks of farmstead cheese paired with a sweet & savory chutney. Saxelby Cheesemongers has teamed up with preserves & pickles guru Kelly Geary of Sweet Deliverance NYC to bring you the finest cheese & chutney selection in town. Each ‘Ploughman’s Lunch’ selection contains a jar of Sweet Deliverance Spicy Green Tomato Chutney and three half-pound wedges of mouth watering fromage: Kunik, a buttery and decadent triple-creme cheese from Nettle Meadow Farm, Shelburne Farm’s sharp, oniony, fruity two-year Cheddar, and Jasper Hill Farm’s luscious, fudgy Bayley Hazen Blue. Not just for lunch, this selection of cheesy goodness is great fare for dinner parties, tailgates, picnics, and any other dairy-centric snacking occasion you can dream up! Beer and Cheese Throwdown, Part Three! 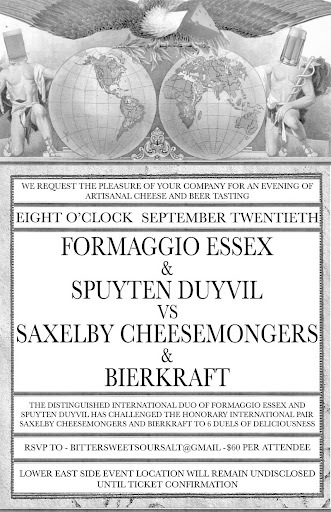 Anyone looking for a gastronomic rumble (and we’re not talking indigestion here) should get in on the action for the third clash of the cheese and beer titans: Saxelby Cheesemongers and Bierkraft vs Formaggio Essex and Spuyten Duyvil. We’ve got a score to settle, and we need your help! This tasting features three rounds of hard-hitting deliciousness, featuring a total of six cheese and beer pairings that are sure to leave your head spinning with delight! Participants vote for their favorite pairings, and at the end of the night, a winning team is declared. Come on out and show your love for Saxelby’s next Monday night! It’s like Monday Night Football, only way tastier. Our Day A-Whey to Washington County was a cheese-tastic weekend filled with local food, farms, cheese, and old-fashioned fun. We’ve updated our flickr page with plenty of delicious photos for your viewing delight! Saxelby Cheesemongers will be back at New Amsterdam Market this Sunday, and every Sunday from now until New Year’s! Come on down to the old Fulton Fish Market and sample our cheesy wares. Good flavors and good feelings abound! ‘Till next week, eat cheese and be merry!